This project, which took place in the fall of 2008, had a number of firsts for me. It was my first experience as an archaeologist on a recovery project, my first time in a helicopter, and my first time in Labrador! The latter two were wonderful experiences, and the first was a learning experience for me. Some of that learning came years later when I looked back on the project. But why do this work if we can’t learn about history, and about how to preserve the archaeological record in varying circumstances. 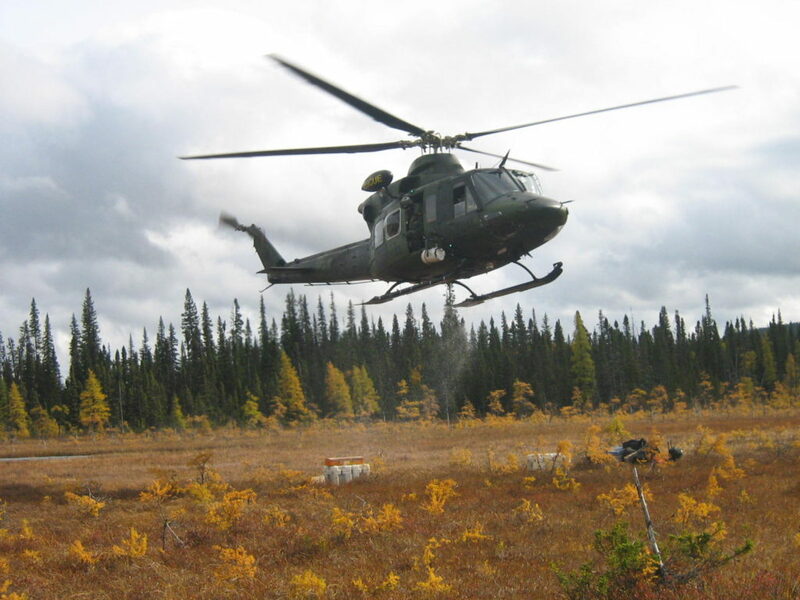 Helicopter leaving me (and half of the team) in the wilds of Labrador. Photo by Lisa M. Daly 2008. 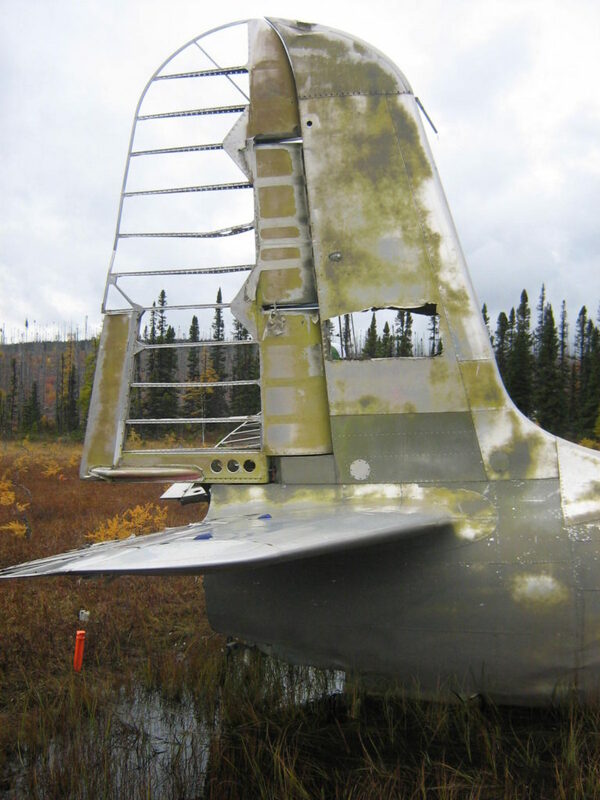 The recovery of the Douglas A-20 was a project undertaken by Underwater Admiralty Sciences (UAS) for the recovery of the aircraft. 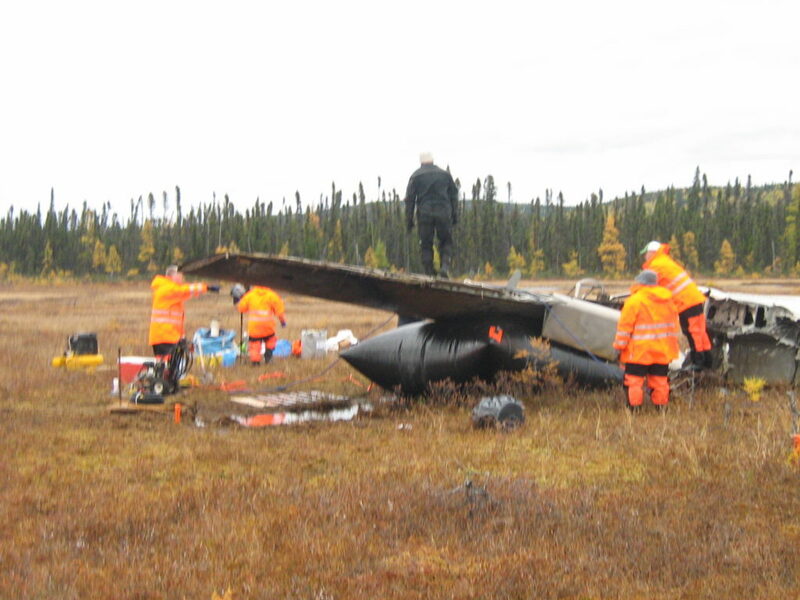 They had gained permission from both the U.S. Department of the Air Force, and the Newfoundland and Labrador Department of Tourism, Culture and Recreation, to remove the aircraft. I was on site as an assistant archaeologist, and then, when my supervisor had to return to St. John’s, the archaeologist on site. 444 Wing Goose Bay provided transportation, as they used our little group as a training, making sure we were prepared to stay out in the field overnight if they were called away. 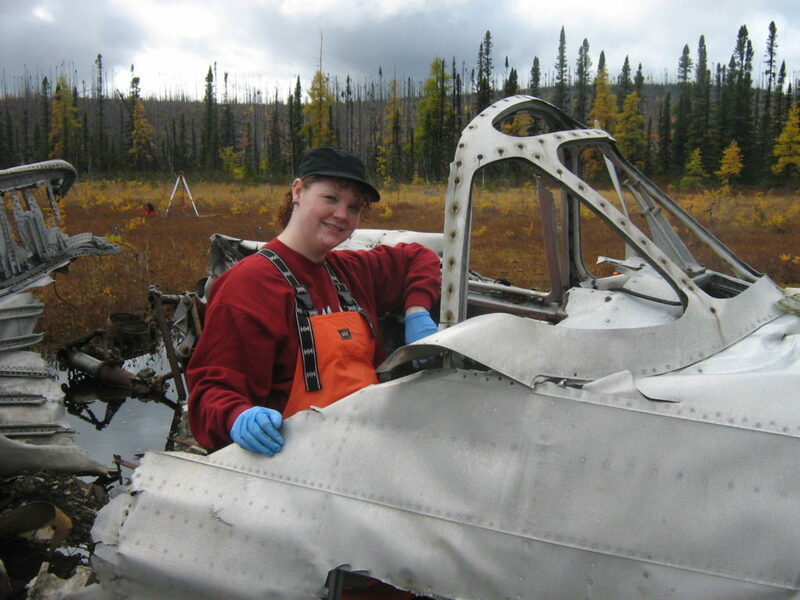 Along with myself, my supervisor and the UAS team, Hollis Yetman was hired as a guide. To be honest, I was a little disappointed that we didn’t get to spend the night in the lean-to he built, but at the same time, didn’t really want to sleep in a small space with a half dozen men! First seeing the aircraft as we landed nearby. Photo by Lisa M. Daly 2008. Douglas A-20 (F-3) 39-741 was one of 63 units ordered by the US Army Air Corp in 1939. This one and two others were modified to be prototypes for high-speed photographic reconnaissance aircraft, therefore had the designation F-3. 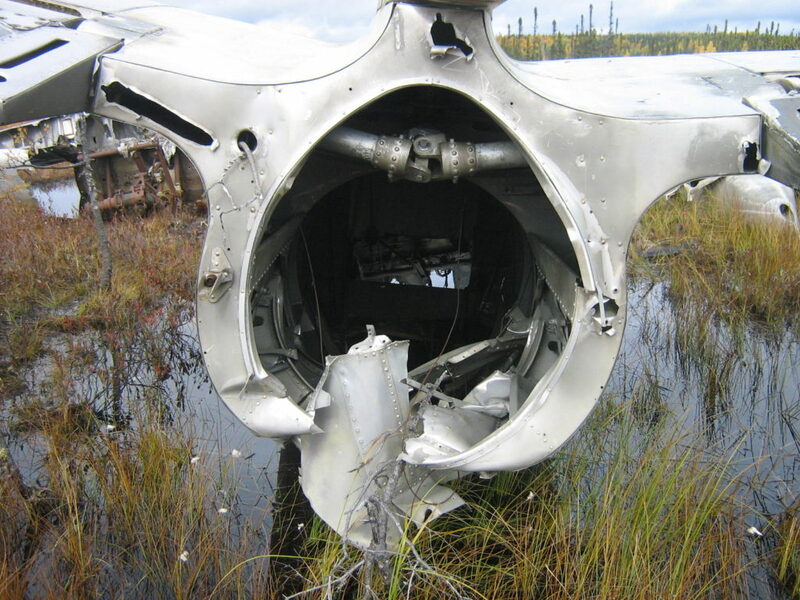 The serial number had been removed from the aircraft by the time of this investigation (not sure if it was done around when it crashed or later), but Mark Allen of UAS said that they found “F-3 #2” painted on the interior sides of the speed rings in the #2 engine. He reported that the F-3 #2 confirms that this aircraft is the second F-3 unit (Deal 2009). The serial number was cut off of the tail. Photo by Lisa M. Daly 2008. 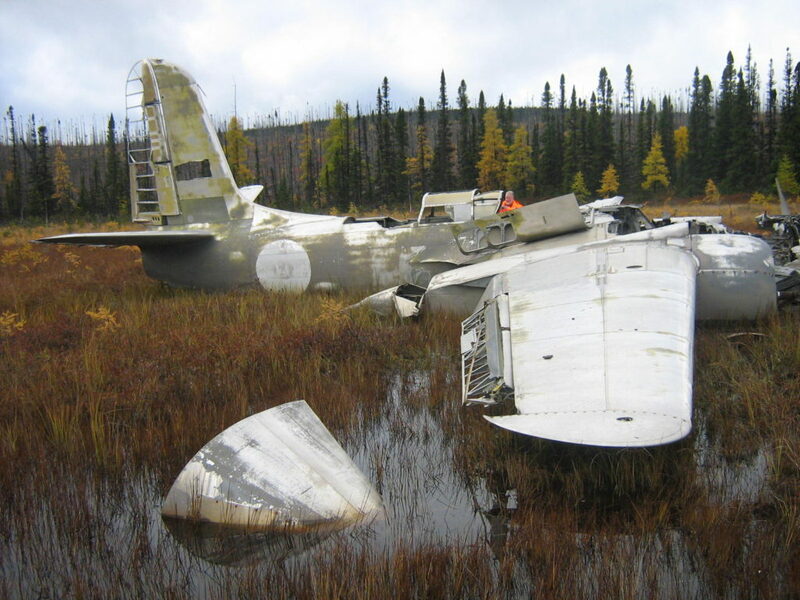 The aircraft was piloted by Captain Secord on 10 October 1942 when it crash landed in a bog in a remote portion of the Little Macatina River, in southwestern Labrador (Allen 2008; Deal 2009). The crash card cites it as being “85 mi. SW Goosebay, Conn. Capt. Secord forced landing fuel shortage. 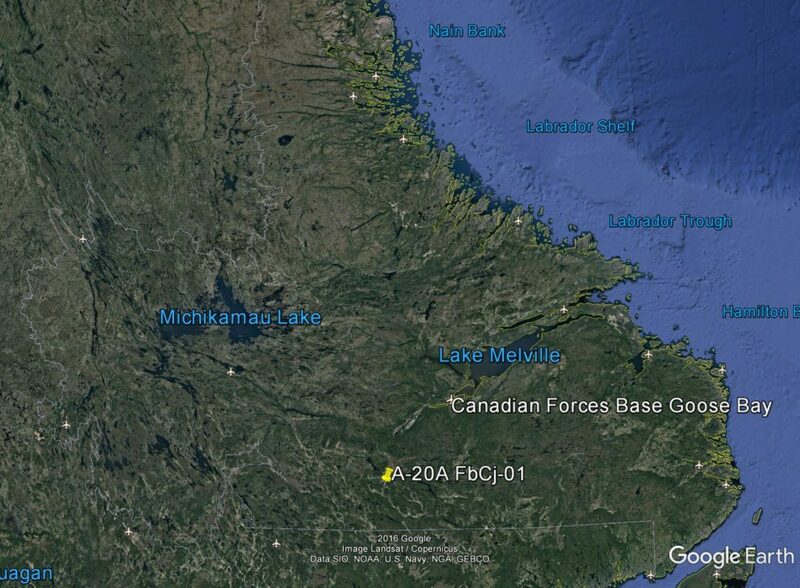 Rep. 1.” but the site was actually “76 miles on a bearing of 218 degrees true from Goose Bay” (Allen 2008). The aircraft was on a reconnaissance mission and landed due to low fuel. The crew were rescued three days later, but the aircraft was abandoned, most likely due to the remoteness of the crash site. Because of this, the aircraft was in relatively good shape with little evidence of activity on the site. That said, the propeller from the starboard engine had been removed, the cockpit had be burnt (perhaps done after the crash to destroy any potential remains of equipment), and some wooden pallets were found on site (Deal 2009). Given the wet nature of the area, those were probably more modern as the wood would deteriorate somewhat quickly if left on the surface of the bog. Location of aircraft. From GoogleEarth 2017. The goal of this project was for UAS to disassemble the aircraft and ship it to Georgia for restoration and eventually to be a museum display. I could not find an update as to the status of the aircraft, but anyone interested in historic aircraft knows that restorations take a lot of time. As this aircraft was to be removed from the crash site, archaeologists were on site to monitor and record the recovery process, to survey the aircraft and the debris field to create an archaeological map, and to record and recover material culture not attached to the main body of the aircraft (Deal 2009). 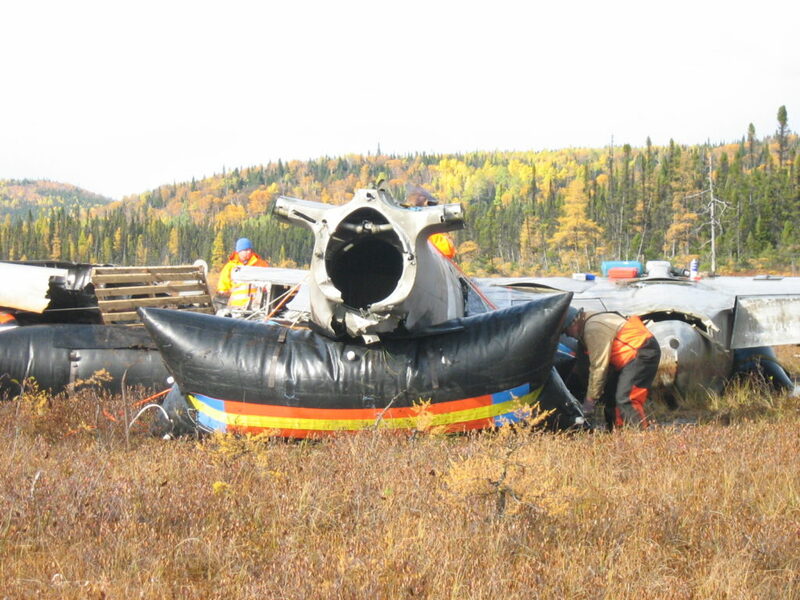 “Floating” the aircraft out of the bog so it could be disassembled. Photos by Lisa M. Daly 2008. The archaeological survey consisted of setting up a site datum and mapping the body of the wreck before UAS could start their recovery. Because we were being air lifted into the site, we had the ability to use large fluorescent pins placed at the end of the wings, the nose at the tail of the aircraft so that a photograph taken from directly above the aircraft could be superimposed on the site map. One of the members of 5 Wing Goose Bay kindly leaned out of the helicopter to take the photograph. 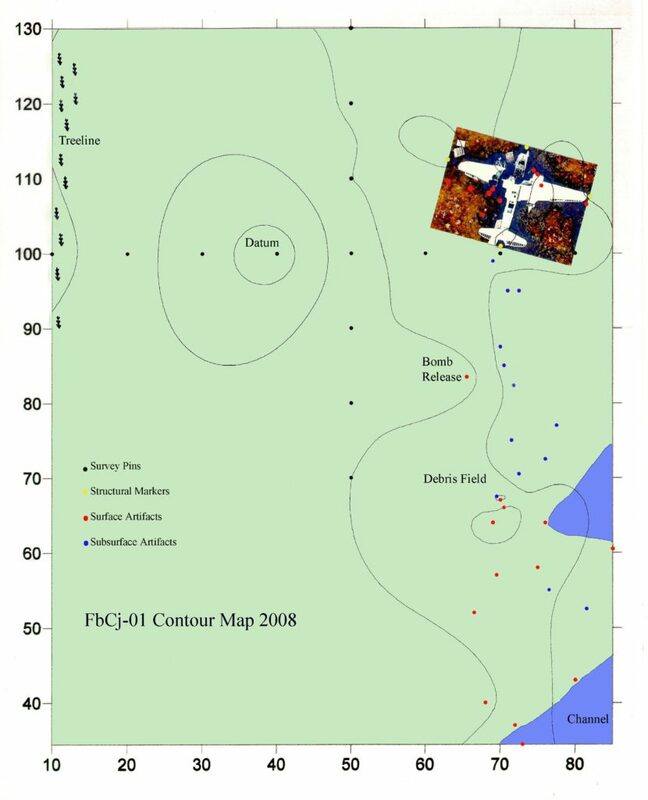 Contour map of the A-20A site in Labrador (Deal 2009). While UAS worked on taking the aircraft apart (which the archaeologists would often stop to watch) we continued to map the site by laying out a grid system to set up a baseline elevation of the site. As it was a bog, there really wasn’t a significant difference in elevation. In fact, because the site was so wet, we had to set up the pallet that was near the aircraft at the datum to be able to get accurate measurements. The ground was soft enough that standing near the surveyor’s level too long would cause it to sink and throw off the measurements. The pallet helped add some stability, and gave whoever was reading the level a spot to stand where they would not sink as much. Every few measurements one would have to walk away to let the ground rebound. The surface debris was recorded, then subsurface debris was identified. 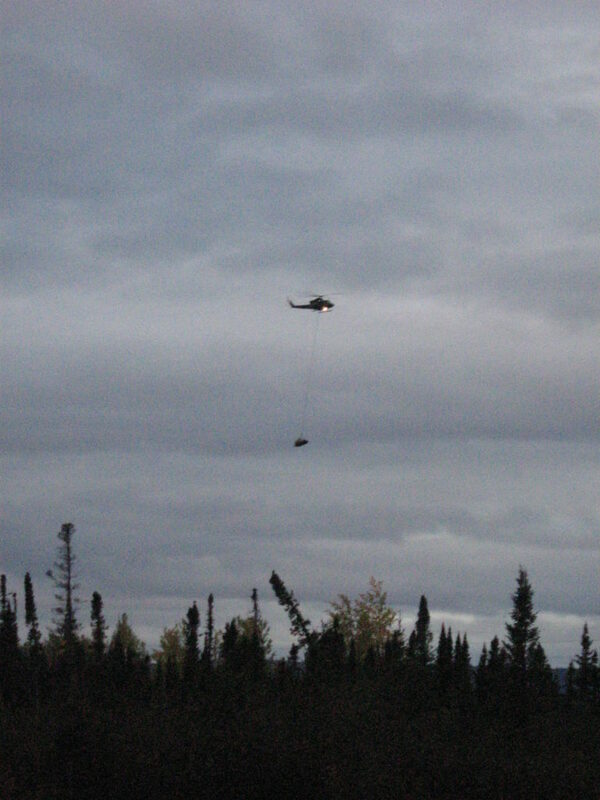 UAS kindly let us use their metal detector (because their was so good, we acquired a similar one to use for recording the Ventura site in Benton, the Hudson in Gander, and other sites) and it allowed us to get a better idea of the debris field. As time (and ability) permitted, the buried material found by the metal detector was uncovered. Some was too deep and were abandoned. Douglas A-20A FbCj-01. Photo by Lisa M. Daly 2008. 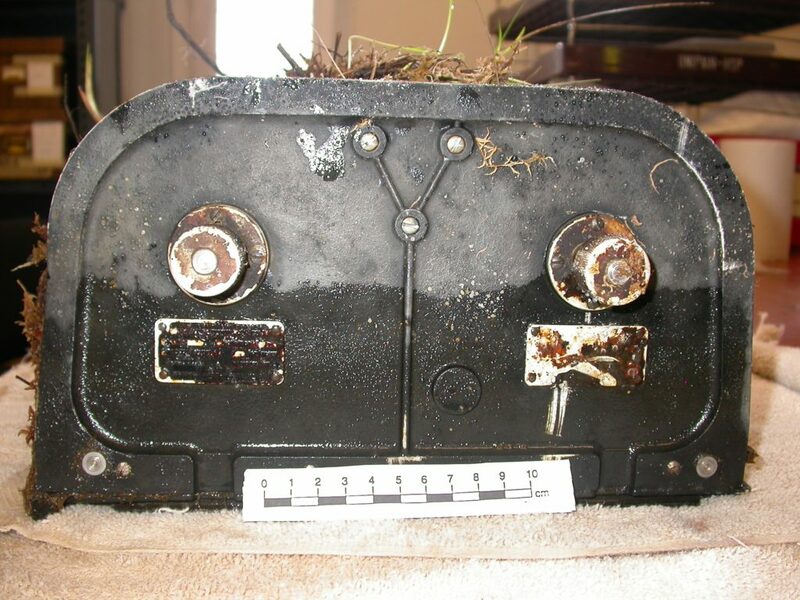 A number of interesting artifacts were found, such as the cockpit escape hatch, part of the cockpit greenhouse (with plexiglass fragments still in the frame), the bomb release frame and lever, and a reconnaissance camera. The camera was of particular interest because it was found in two parts near the wing (where it would have been mounted). The case and cover were separate and there was still a little bit of film in the camera. The layout and ripping across the camera suggests that at the time of the rescue, the camera was probably removed from the aircraft, the cover taken off and tossed aside, and the film ripped out. What was left was packed with sphagnum moss for conservation purposes, then freeze dried when it was brought back to Memorial University. It was the end of the film, so nothing was on it, but it was still a rare find. Body of the camera with moss packed inside to preserve the film until it could be brought to the conservation lab at MUN. Photo by Lisa M. Daly 2008.
approached the bog at a bearing of 85 degrees to the northwest. It may have hit tail first, tearing away the underbelly. A concentration of artifacts from the cockpit area indicates that the nose of the aircraft hit hard and was torn away, leaving much of it imbedded in the bog. The aircraft then veered to the right and came to a stop at a bearing of 115 degrees to the northeast (Deal 2009). Looking in the tail section. Photo by Lisa M. Daly 2008. While the archaeological survey went relatively smoothly, the recovery seemed to have a number of problems, from trying to find and transport equipment to the site, to some of the bolts being too rusted to be able to easily remove, to the engines being too heavy and at first it was thought they might end up left in the bog. As well, when 5 Wing was slinging back parts of the aircraft, the wind would take the cumbersome pieces and cause them to spin. The first time it happened, the slight wound so tightly that it snapped back to unwind, and the crew almost ditched the piece, thinking it was going to cause an accident. Once it was figured out what was happening, the pieces were safely transported. The project started a few days later than expected due to hurricanes and low cloud cover, and, because of the hurricanes, the site was much wetter than anticipated. But, overall, the project was completed, and the aircraft is in Arizona awaiting restoration (Goose Hawk Unlimited 2017). Images can be found at goosehawkunlimited.com. Taking a moment to pose while examining the debris inside the cockpit. Photo by Robert Mester 2008. As I said at the start, this was a learning experience, both for myself and for the provincial protection of our aviation material. 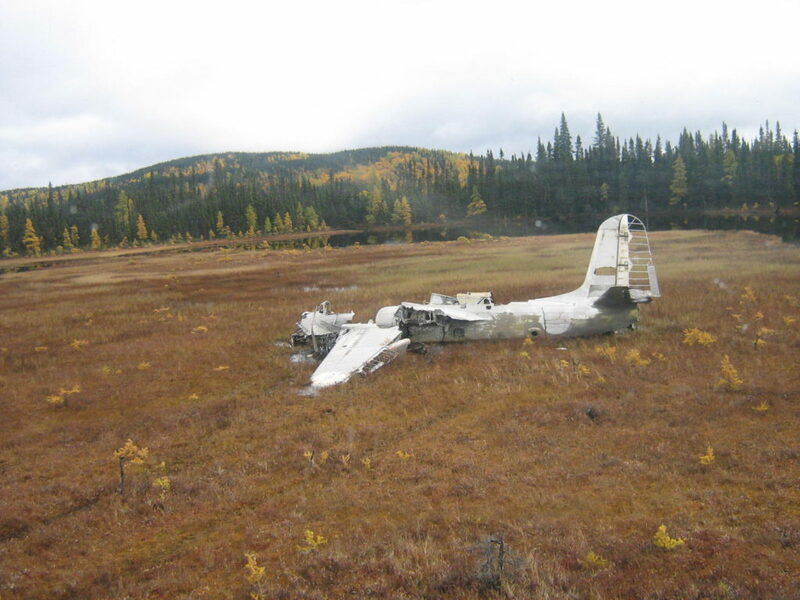 As more work is done, better legislation is written to help protect this material culture, but at the same time, the interest in not necessarily in just leaving airplane wreckage in the forests and bogs of Newfoundland and Labrador to eventually deteriorate. When projects are serious and will help to preserve material, then there is a chance to be able to remove it in an attempt to better preserve it. Brining in a section of the aircraft. Photo by Lisa M. Daly 2008. 2008 A-20A Havoc: U.S. Army Air Corps Serial Number 39-741 Recovery Proposal. On file: Provincial Archaeology Office. 2009 The A-20 Havoc Recovery Project. Provincial Archaeology Office 2008 Archaeology Review, vol. 7, pp. 30-35. 2017 Douglas A-20 Havoc. http://www.gosshawkunlimited.com/projects/potential-projects/douglas-a-20-havoc/ [accessed 22 Feb 2017]. A list of surviving A-20s can be found here. 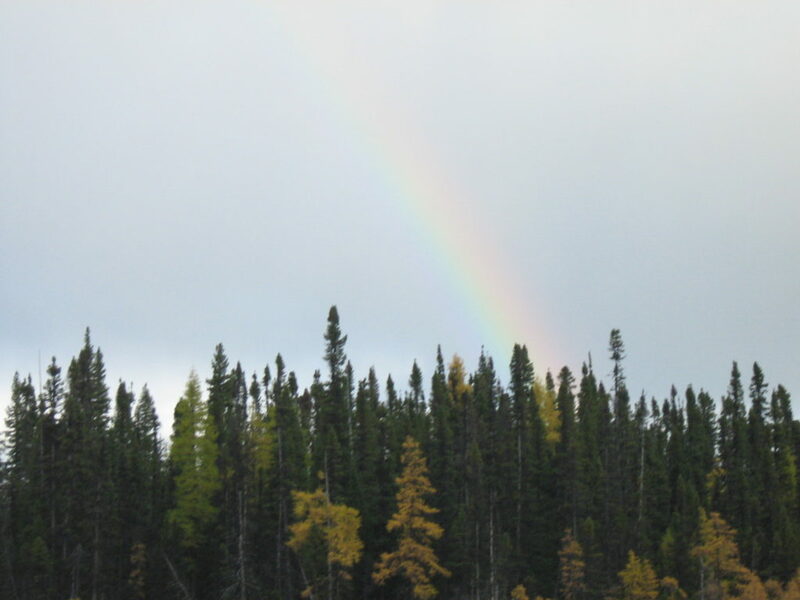 More pictures of this site and others around Goose Bay can be found here. A rainbow over the crash site. Photo by Lisa M. Daly 2008.